Here is where I work at the Human Media Lab. I've got a great view overlooking the construction on the Queen's Centre, and I'm sporting two computers, and a bunch of random other techno-gear, which makes me excited. 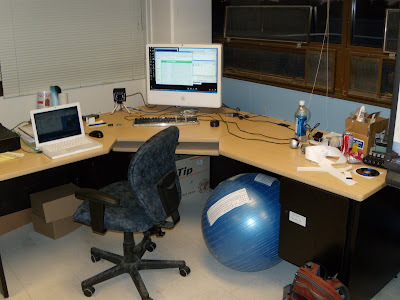 The giant blue ball under the desk is a prototype I'm working on. Authored by Dustin at 6/02/2008 11:02:00 p.m.